Tanki Online Mobile (aka. TO Mobile) is the mobile version (client) of Tanki Online, publicly available on the Google Play store for Android devices. The app can be downloaded by the majority of modern Android devices. TO mobile isn't available for iOS (Apple) mobile devices as of now, although the developers are working on it. TO Mobile can be downloaded almost worldwide, with the exception of CIS territories, North America, and South America. The app is planned to be available for the aforementioned regions in the near-future. The reason that the app wasn't launched worldwide at once was because of a process called "phased implementation" that the developers decided to undertake. Basically, phased implementation introduces a new system (in this case TO Mobile) gradually by making it available to a select audience at first and increasing the audience as times goes by. This ensures that any major bugs or issues in the app won't be so drastic or affect as many people when/if they do happen. As a result of this, TO Mobile was first made available only to a selected group of testers - who could earn rewards for reporting bugs - and then was gradually made publicly available in various countries until it is where it is now (available almost worldwide). 1.1.1 What if the "not available for your device" error shows up on the download screen? 1.1.2 What if the "This item isn't available in your country" error shows up on the download screen? TO Mobile is available to download for free in the Google Play store (an app that comes with all Android smartphones). Simply go the Play Store and search for "Tanki Online", press "Install", and then follow the on-screen instructions. Alternatively, you can use the link below which will take you directly to the Play Store. The average Android smartphone usually meets the minimum requirements. However, if you are facing installation errors you may want to go through the system requirements shown below to ensure that your device supports TO Mobile. The most likely issues are that your device doesn't have enough memory, or is below Android version 5.0. What if the "This item isn't available in your country" error shows up on the download screen? This means that the app isn't yet released in your region. TO Mobile is available almost worldwide, but not quite. It isn't available in Russia, CIS territories, North America, and South America. So if you are in one of these regions, you will have to wait until it's released in your area. Follow the news! For a complete list of countries in which TO Mobile is released, check out this part of V-LOG #195. TO Mobile has many unique features. Some of them are good and positive, such as the free items and special events, while others are not so good, such as the battle list which isn't available. Below is a list of the most major positive and negative features of the app. Events unique to TO Mobile such as the Parade of the Beginners are available. Clans system hasn't been added yet. The developers are actively working towards adding as many "missing" features as possible and overall improving TO Mobile. The TO Mobile interface is significantly different from the standard version as it has been reworked for the convenience of playing on small screens such as that of smartphones. The interface relies heavily on the use of icons. Check the News in the Communicator panel. The navigation bar is located on the left. It allows you to get into the various menu(s) of the following components: selecting a battle, customizing your tank in the Garage, accessing the Daily Missions menu, editing the Settings, reading the news about the game, and even viewing messages in the Chat. On the right side is the battle group menu, as well as a list of friends. 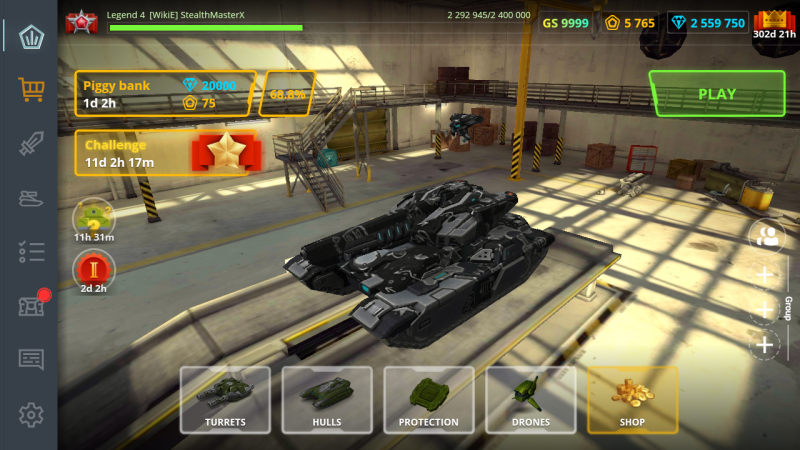 One of the main features unique to the mobile version is the “Supply Box” - this is a special type of Container that is present exclusively in TO Mobile. The Supply Box contains 3 random prizes, among which there can be 2 units of any supply (except gold boxes), or 250 crystals. This item is issued free of charge to players in the Mobile version every 6 hours. The Mobile version's Shop has the same items that are sold in the standard version - such as special offers, crystals, premium accounts, gold boxes, paints, and kits. The Rename Pass and Promo Codes' sections are not yet available. To get into a battle, you must click the "Play" button on the start screen. You will get into a battle with a randomly selected Battle Mode. If you click on the gear next to this button, you will find yourself in the battle mode selection menu. Battles in the mobile version are only Matchmaking. There is no battle list or PRO battles available in TO Mobile. To facilitate control on mobile devices, TO Mobile introduced a number of new features, such as a an aiming "aid" which works like this: if a tank is in the path of your turret, a red border will show up around the tank; this simplifies the task of hitting enemies in a dynamic battle using touchscreen controls. In addition, it is possible to "set" supplies which are on cooldown to automatically activate when they are available; this can be done by tapping them during their cooldown. These features give a significant advantage to Mobile users, which helps counteract the advantages PC players have against Mobile players. TO Mobile also offers rewards for watching ads. You can get Supply Boxes, an increased battle reward, change your Daily Missions, and even speed up Micro-upgrades for free just by watching ads. Whenever you can watch an ad to get a reward, a little "play" icon ► will be displayed next to a picture/description of the reward. This page was last modified on 15 January 2019, at 20:11.